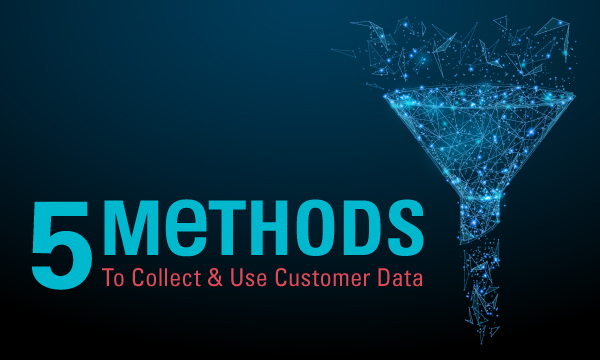 5 Methods To Collect and Use Customer Data -HindSite Interactive, Inc. Whether the data collected is intended for growing your email/marketing lists, nurturing campaigns, client retention or researching current demographics; collecting and storing data is a vital means to knowing and understanding your users. These 5 methods will offer a good starting point in creating a full data collecting program. First and foremost you should have some form of analytics software running on your website. 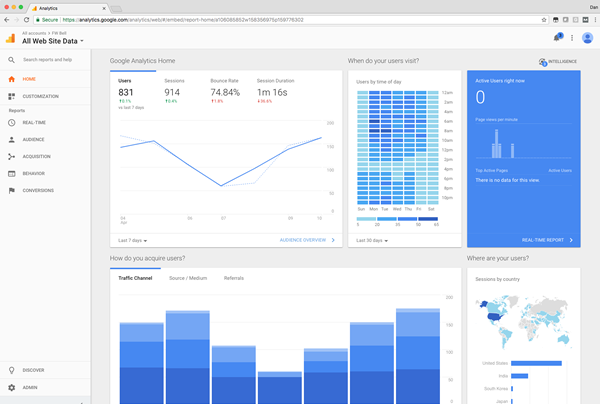 Google Analytics (GA) is the standard free-ware, but other services are also available. GA collects various amounts of data about how people use a website, and can be integrated into SalesForce or other CRM (customer relationship management) systems. Google Analytics can also be used as a marketing metrics tool, to determine which marketing campaigns are netting traffic and conversions to your site. You can track inbound traffic from social media and search engine profiles, 3rd party apps, like Yelp, and local searches. From this data you can verify which campaigns were more successful and how to proceed with future initiatives. A website audit will often provide you with a full examination of your website’s performance, and help to determine if the site is achieving your business goals. We touched on this topic a while back, with our post 7 Ways to Determine if Your Website is Working for or Against You. Analytics collects data outlining which pages are viewed the most, how long visitors view those pages and to what pages visitors navigate to next. This can help with writing future content, to better engage with your audience. On the other hand, you can quickly determine which pages are not being visited or read by users. Meaning it may be time to reassess those left-behind pages, to uncover whether or not they are necessary; or if it’s time to employ new tactics to better engage with your visitors… Because, you guessed it, Google Analytics can also track what people are searching for on your site. 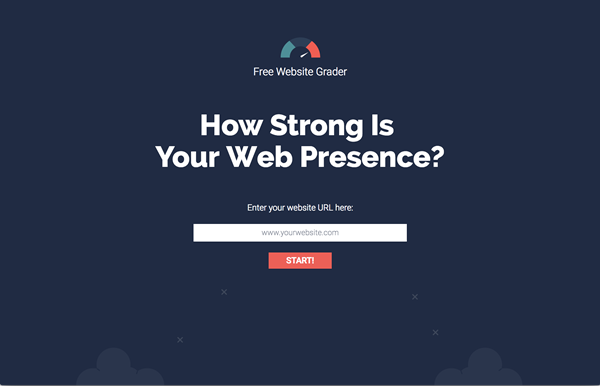 Take the first step and Grade Your Website Now! Collecting customer contact data is critical to any future communication and sales. Keep it simple though, only collect the information that you need. A long form can possibly turn users away from submitting; so do a little research to find out the bare minimum to collect, as well as what fields are the most engaging. Adversely, longer forms should be used when and where appropriate, but those forms may require an incentive for users, such as a time-sensitive offer, free ebook, lottery entry, etc. 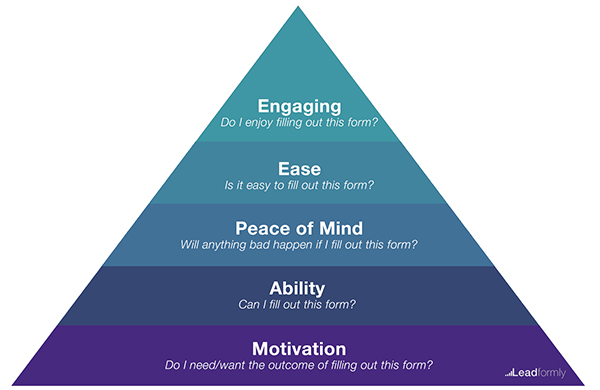 Leadformly’s Form Optimisation Pyramid, outlines five elements that influence the likelihood of someone completing your form. 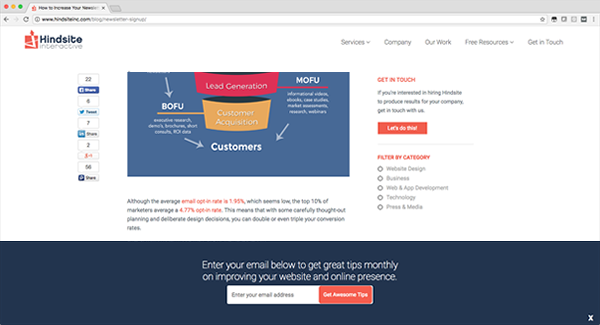 Anchor a message with email submission to the top of your site’s page. 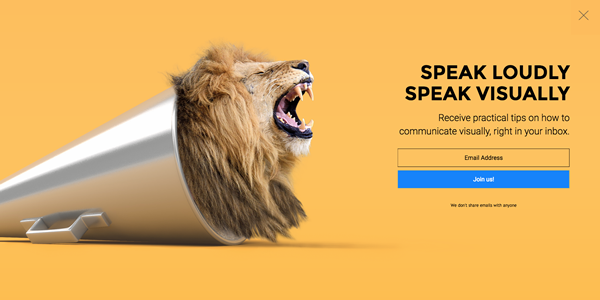 Services like Hello Bar, are designed to stick to the top of your website. They engage the visitor’s attention and display a simple message to compel action. Pair an additional offer or incentive with normal or on-site communication. Rewarding a users’ signup with a better or more valuable offer will incentivize the visitor to share their contact info with you. Offering a free ebook at the bottom of a blog post, with more in depth information about the topic covered, will provide an easy opt-in for visitors to access content they’re already interested in. 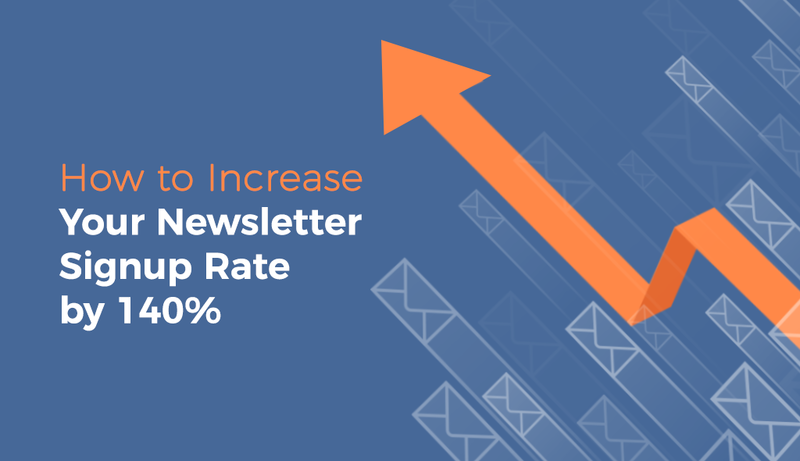 Similar to the above recommendation, when your blog post, infographic, download link, etc has concluded, add a quick request to sign up for your newsletter or email updates. If the visitor found the content interesting, he may be interested in future communication. This is relatively new technology. Exit intent is an action taken by the user that could result in him leaving the website, this could be scrolling up the page or moving his cursor toward the browser tab. Setting a condition that automatically displays a pop-up graphic, when a visitor exhibits intent to exit the site, with a queue to sign up could result in a signup. 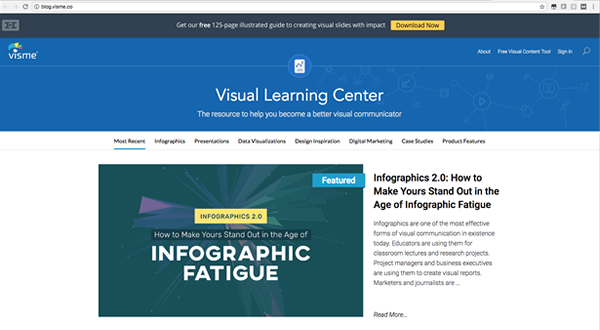 Setting a condition that automatically displays a pop-up graphic, with a request to sign up, requires the visitor to pause and read the information, then decide to sign up, close, or continue browsing your website. You can create a custom landing page whose sole purpose is to capture contact information. Take the incentive from the previous Reward tip and build a page with custom content around it to entice viewers to sign up. A new experience is a great reason to engage with users in order to find out if the new process/system/area of the website contains any issues or causes confusion with the people using it. Following up with your actual users, after they have completed navigating the new experience, will provide more insight than a test or focus group. A more thorough look at the benefits of a user panel over test groups outlined here. Parsing out those users who complete a new task or process will create a pool of candidates to send surveys. From here you should receive some actionable items based on the user feedback, whether positive or negative. Positivity is wonderful and shows success, while negative feedback merely outlines where there is room to improve. Again, analytics is the multi-tool for website data. Checking your desired results against the collected user data will give you a good idea if the new feature/process is successful. For example: if the goal is to reserve a hotel room, and the newly added “room calculator” isn’t functioning properly, you will most likely see a high abandonment rate on this page; thus, denoting that there is a problem. Websites that require regular or semi-regular user access, will greatly benefit from implementing a system for finding and responding to users with lapses in access. This can also be beneficial to companies that offer password protected content such as literature requests, knowledge bases, training modules, etc. Users may have had a problem that went unreported or were so successful that access is no longer necessary. Either way that information will only help your future endeavors. Integrating users with lapses in login time, into a drip campaign or lifecycle email schedule will often bring them back into the fold or inspire another action. These emails are often scheduled based on specific events or triggers. Let’s say a user hasn’t signed in for one month. After one month, the system recognizes the user has not signed in, an email is sent to that user as a reminder. After a couple days of continued inactivity, another reminder email is sent and shares additional information. A week may go by before a final email reminder is sent. This process could continue, deactivate the user, or trigger another round of emails. Going a step further, a survey could be sent to the user(s) in question, to determine the reason behind inactivity or deactivation; adding user awareness to your team’s data. 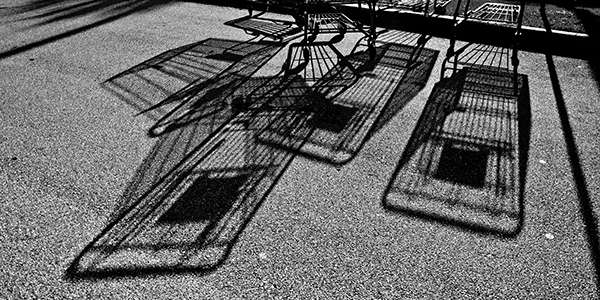 One of the most reported issues for e-commerce sites is shopping cart abandonment. According to Listrak, 78.00% of average consumers abandon their shopping cart before making a purchase. The problem with abandonment is the typical user hasn’t provided any information to you before leaving their cart. So let’s increase the likelihood of the prospective customers return to finish their purchase. Suggesting to save your cart is a quick way for the user to save and return later, but also to retain their email address for future communication. That’s right! This is the perfect situation to employ a pop-up message that appears after leaving the cart page, without purchasing. You could even combine the ‘save your cart’ action into this message as well. Once collected, a remarketing campaign could be initiated with an abandonment email to encourage the purchase, or display products that other users purchase with the item(s) in their cart. User data is a tool that offers significant advantages when working to drive sales and communicate better with your customers. 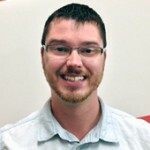 Now ask yourself this question: how well am I using data to understand my user behavior and connect with my leads? If you have difficulty answering that, you’re likely not taking advantage of the data and metrics you’re collecting. As the Art Director and a Project Manager at Hindsite Interactive, I create visual solutions for our clients on web, tablet and mobile platforms, and serve as the user experience designer at the shop.